iTunes Converter for Win Version 2.1.4 has been released. With the latest version, users has one new output format choice: FLAC. 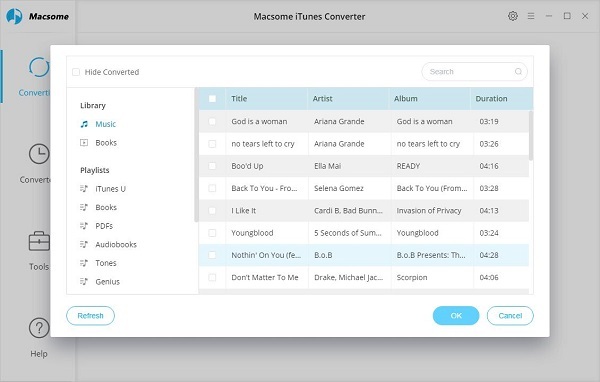 In other words, you can convert your iTunes Audio tracks, including purchased music files, subscribed Apple Music and purchased Audio books to FLAC with upto 10X conversion speed now. FLAC stands for Free Lossless Audio Codec, an audio format similar to MP3, but lossless, meaning that audio is compressed in FLAC without any loss in quality. This is similar to how Zip works, except with it, you will get much better compression because it is designed specifically for audio, and you can play back compressed FLAC files in your favorite player (or your car or home stereo, Android 3.1+ devices, Sandisk Sansa, RIM BlackBerry, TrekStor, Cowon, iRiver, Creative Zen, HiFiMAN, Archos, Latte and so on.) as you like. It stands out as the fastest and most widely supported lossless audio codec, and the only one that at once is non-proprietary, is unencumbered by patents, has an open-source reference implementation, has a well documented format and API, and has several other independent implementations. It is an open format with royalty-free licensing and a reference implementation which is free software. 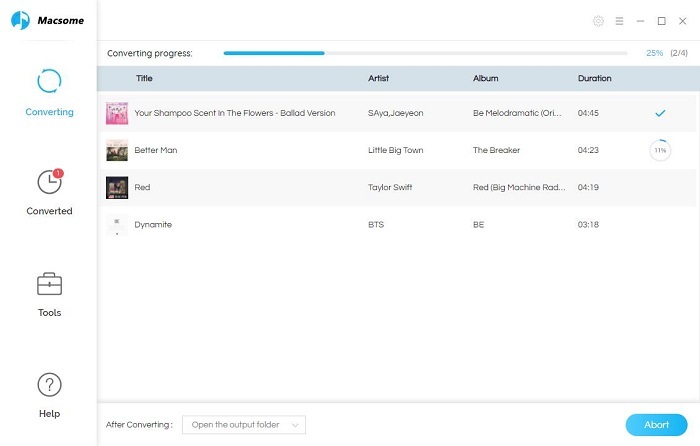 FLAC has support for metadata tagging, album cover art, and fast seeking. 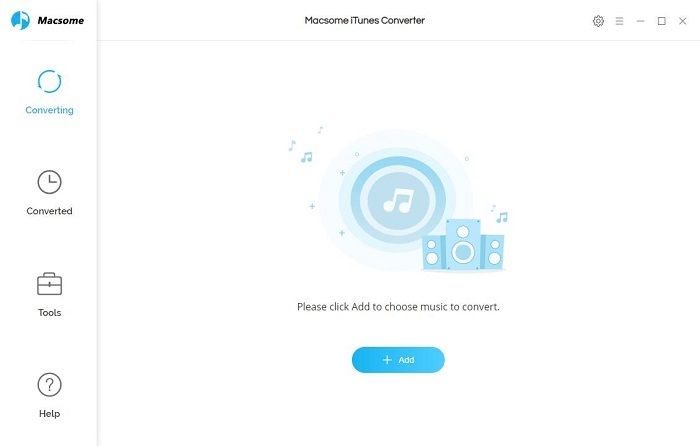 In Summary, there are some this and that cases you need to convert them to FLAC format, Macsome iTunes Converter just thought of this, and newly added FLAC output fortmat to the latest released version. First, go to download and install the latest version of iTunes Converter on your PC, run it. Please make sure that your iTunes Converter is the latest version, or you can open the software and click "Menu - Check for Updates" to check and update to the latest version. Second, click the Add button, you can choose the different iTunes library to add the audio files. And select the file you want, click "OK", and then all files you selected will be listed on the main window. 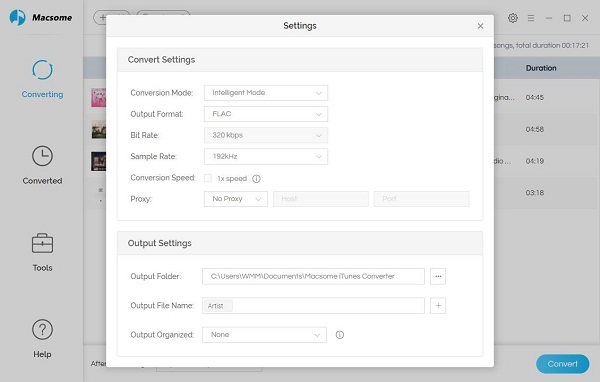 Third, click Setting icon to set FLAC as the output format and output path before the conversion as your need. Finally, click the Convert button. After the conversion, you have converted Apple Music to FLAC, and you can play the converted FLAC audio tracks on your car, if you have cancel your Apple Music.